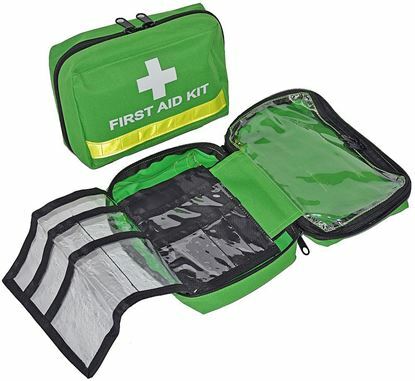 Supplied with 3M REFLECTIVE top quality weather-proof vinyl first aid striping on 3 sides and First Aid Kit label complying with Australian Standards for first aid labeling. Size approx. W 36cm x H 50cm x D 20cm. Weighs only 2kg. Backpack only, no first aid kit contents. Hard, weather-proof plastic kit box with 2 fold out trays and reflective signage + striping. Closed size 40cmL x 23cmW x 20cmH. Made in Australia. Hard, weather-proof plastic kit box with 6 fold out trays and reflective label and striping. Adjustable internal tray dividers. Closed dimensions 47cmL x 30cmW x 25cmH. Made in Australia. Three zippered compartment (main,internal under lid and front pocket). Thick quick-release adjustable belt. Size: 31cmL x 14cmH x 12cmD - Only 146g. First Aid green outer with new D/N high visibility reflective strips on both sides, printed brilliant white cross and 'First Aid Kit' complying with Australian Standards for first aid signage. Made from top quality robust 600D water repelling canvas material. 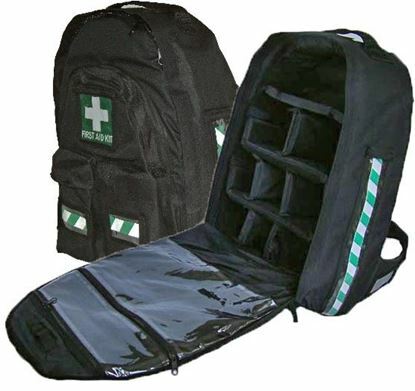 Quality thick 600D heavy duty canvas outer, with day/night high visibility reflective stripe panel, labeled to Australian Standards for First Aid Kit use. This case bag is versatile. It comes with an adjustable heavy duty thick shoulder strap so the case can be worn over the shoulder or around the waist like a big bumbag. Clever design allows all pockets to be easily accessible from the top when worn around the waist or over the shoulder. 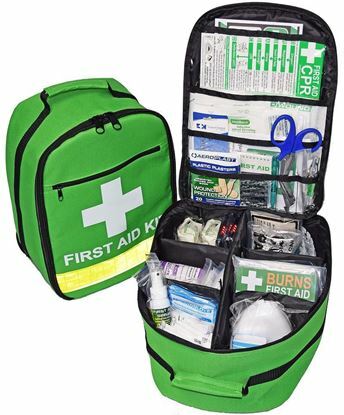 CASE ONLY - NO CONTENTS - See First Aid Kit range for filled kits. Portable and wall mountable, strong steel metal cabinet with hygienic white gloss enamel finish inside and out. 28cmW x 44cmH x 14cmD. Lockable with 2 keys supplied. Variety of storage heights and compartments. Has handle on top so it can be lifted up and quickly removed from wall for carrying to the injured, then easily returned to the wall mount screws. Easy to wall mount with screws (screws not supplied). 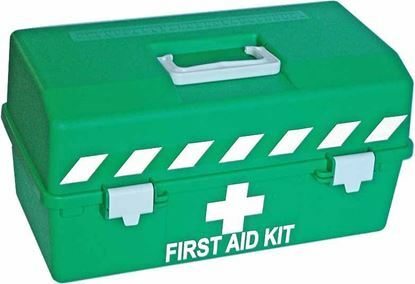 Comes with large plastic self-adhesive sign for front door which complies with Australian Standards for first aid signage and top quality 3M reflective striping. 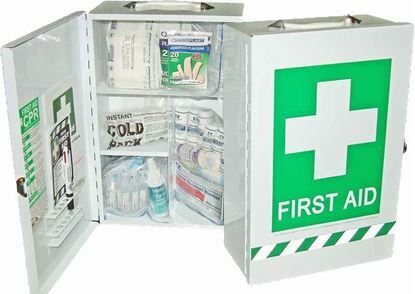 CABINET ONLY - NO CONTENTS - See First Aid Kit range for filled kits.